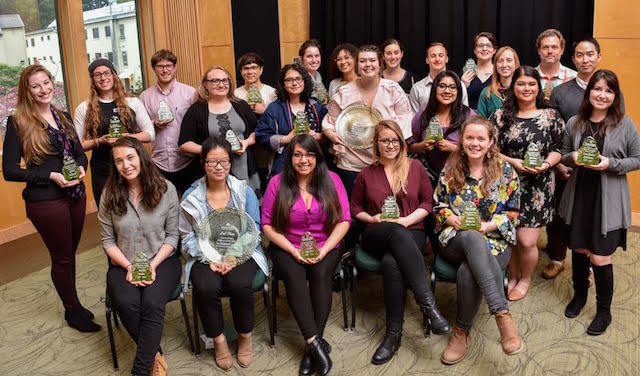 Humboldt State University's Outstanding Students of 2018-2019 were honored at an awards ceremony April 11. Congratulations to all the winners! Linh Pham’s commitment to her field shines through everything she does. A senior double majoring in cellular/molecular biology and chemistry, Pham’s desire to be a physician scientist led her to summer programs at the Michigan State University’s Plant Research Lab, Johns Hopkins University, and the National Institute of Child Health and Human Development. Advisors describe her as mature, engaged, and highly motivated. “She is the real thing, a scientist of heart and mind,” one advisor says. Pham has also brought an undergraduate research project from infancy to completion while excelling in upper-level chemistry and biology courses. She works as a peer mentor in HSU Biology Professor Amy Sprowles’ lab, and as a community tutor for 11 different courses through the Learning Lab, showing patience and insight with science students. In addition to her rigorous academic work, Pham is an active leader in co-curricular activities. She is the treasurer of the Society for Women in Math & Sciences club at HSU for which she has written proposals and co-organized fundraising events; she volunteers for the Humboldt County Breast Health Project; she is an active member of HSU’s Indian Natural Resources, Science and Engineering Program; and she writes for the Lumberjack. Described as a diligent leader, Amanda Ramirez-Sebree is being recognized for her longstanding commitment to the Youth Education Services (Y.E.S.) program, which she began volunteering for in 2014. An Environmental Science & Management senior, Ramirez-Sebree quickly became the director of Y.E.S.’s Study Buddies program, which offers tutoring to local elementary and middle school children. During her time at HSU, she also volunteered with Y.E.S.’s Environmental Education and Juvenile Hall Recreation programs, and supported all 16 programs in her role as a program consultant. While serving as the Y.E.S. Governing Body co-chair in spring 2015, Ramirez-Sebree demonstrated exceptional time management, facilitation, and leadership skills in mapping and achieving committee goals each semester. She has also worked as a Development Team Member with Humboldt Energy Independence Fund, a student-run organization that focuses on creating a more sustainable campus by implementing projects inspired by student ideas. She was part of a team that developed and researched an LED lighting retrofit project for a building at HSU. Ramirez-Sebree is currently working with the HSU Library as a Y.E.S. archive intern. She is archiving historical materials of importance to highlight in a book recording of Y.E.S.’s 50 years of operation and community outreach. She is also working as the 50th Anniversary Outreach Director, assisting Y.E.S. with planning and implementation of its 50th anniversary event. 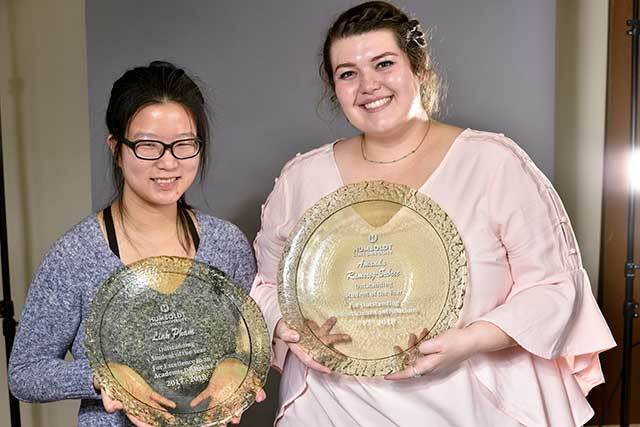 Linh Pham (left), a senior double majoring in cellular/molecular biology and chemistry, and Amanda Ramirez-Sebree (right), an Environmental Science & Management senior. See more photos of the Outstanding Students Awards here.